As Enterprise organization employee choice programs continue to grow in popularity, there are some trends that truly stand out. For starters, 68 percent of enterprise workers credit their level of productiveness to the machine/device they work on. On top of that, 77 percent say they're more likely to accept and stay on at a company that offers them a choice on the device(s) they use. It's defined as the practice of giving employees the freedom to pick their computer and mobile hardware they're most comfortable with. This usually breaks down to a choice between Apple (MacOS /iOS) and PC (Windows/Android) hardware. These programs have proven to become a major influence on employee's overall experience with a 90 percent approval rate. With numbers like that, choice programs are undoubtedly here to stay. When it comes to productivity, technology choice is king. 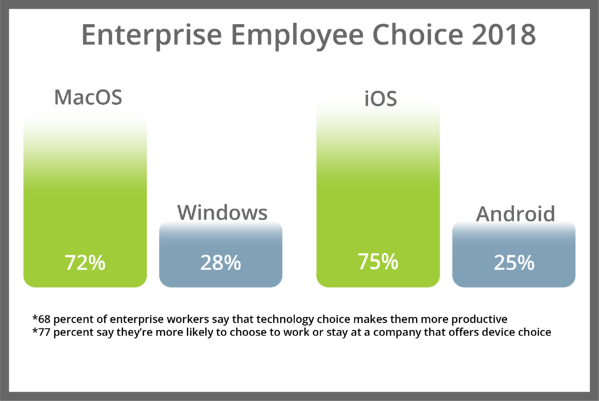 While enterprise employees stated a variety of benefits to working on their preferred device, 68 percent said technology choice made them more productive. Improved creativity (37 percent) and collaboration (35 percent) came in second and third, and 35 percent of respondents said using their device of choice made them proud of where they work. By giving employees access to the technology they are most familiar with, organizations are able to change the way employees both work and perceive their employer. Regardless of the company, when employees are given the technology they want, employers are rewarded with the best, most productive and appreciative employees.